Join us for our annual Harvest Festival! Our grape-stomping contest is a smash every year along with great music & food! Festival entry is $15.00 per person and includes a glass of wine or beer and souvenir wine glass!The end of our harvest means the end of our grueling 12 hour work days. So let’s celebrate! We will have live music all day, drink specials and our annual grape stomping competition. 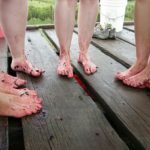 Grape stomping is done in teams of two – one stomper and one “catcher”. First to fill a pitcher wins! $15 per team to enter – participants must be 21 or over; register on event day.